Xypex is a unique chemical treatment for the waterproofing, protection and repair of concrete. XYPEX CONCENTRATE is the most chemically active product within the Xypex Crystalline Waterproofing System. 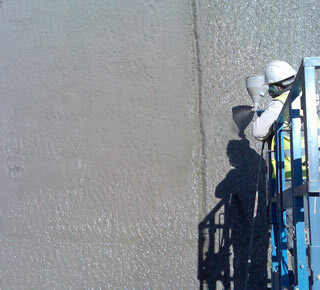 When mixed with water, this light grey powder is applied as a cementitious slurry coat to above-grade or below-grade concrete, either as a single coat or as the first of a two-coat application. It is also mixed in Dry-Pac form for sealing strips at construction joints, or for the repairing of cracks, faulty construction joints and honeycombs. Xypex prevents the penetration of water and other liquids from any direction by causing a catalytic reaction that produces a non-soluble crystalline formation within the pores and capillary tracts of concrete and cement-based materials. Xypex Concentrate is available in 20 lb. (9.1 kg) pails, 60 lb. (27.2 kg) pails and 50 lb. (22.7 kg) bags. For normal surface conditions, the coverage rate for each Xypex coat is 6 to 7.2 sq. ft./lb. (1.25 - 1.5 lb./sq. yd. Or 0.65 - 0.8 kg/m2). Two in. (51 mm) thick, 2000 psi (13.8 MPa) Xypex-treated concrete samples were pressure tested up to a 405 ft. (124 m) water head (175 psi/1.2 MPa), the limit of the testing apparatus. While untreated samples showed marked leakage, the Xypex-treated samples (as a result of the crystallization process) became totally sealed and exhibited no measurable leakage. Twenty cm thick Xypex-treated concrete samples were pressure tested up to 7 bars (230 ft./70 m water head) for 24 hours to determine water impermeability. While the reference specimens measured water penetration up to a depth of 92 mm, Xypex-treated samples measured water penetration of zero to an average of 4 mm. Xypex-treated concrete samples were pressure tested to a maximum 7 bars (230 ft./70 m water head) for 10 days. Test revealed that while 25 ml of water had penetrated the untreated concrete samples, zero ml had penetrated the Xypex-treated samples. Test specimens were then broken and showed water penetration to a depth of 15 mm on untreated samples but no measurable water penetration on the Xypex-treated samples. reduced the penetration of these solutions. Xypex-treated cylinders and untreated cylinders were exposed to hydrochloric acid, caustic soda, toluene, mineral oil, ethelyne glycol, pool chlorine and brake fluid and other chemicals. Results indicated that chemical exposure did not have any detrimental effects on the Xypex coating. Tests following chemical exposure measured an average 17% higher compressive strength in the Xypextreated specimens over the untreated control samples. Xypex-treated mortar and untreated mortar were measured for acid resistance after exposure to a 5% H2SO4 solution for 100 days. Xypex suppressed concrete erosion to 1/8 of the reference samples. Xypex-treated samples restricted chloride ion concentration to below the level necessary to promote electrolytic corrosion of reinforcing steel. Visual examination of untreated panels after 50 freeze/thaw cycles showed a marked increase in surface deterioration compared to Xypex-treated samples. The resonating frequency of both untreated and Xypextreated concrete samples were measured throughout 435 freeze/thaw cycles. At 204 cycles, the Xypex-treated samples showed 96% relative durability compared to 90% in the untreated samples. At 435 cycles, the Xypextreated samples measured 91% relative durability compared to 78% in the untreated reference samples. Exposure testing of potable water in contact with Xypextreated samples indicated no harmful effects. After exposure to 5.76 x 104 rads of gamma radiation, theXypex treatment revealed no ill effects or damages. Concrete surfaces to be treated must be clean and free of laitance, dirt, film, paint,coating or other foreign matter. Surfaces must also have an open capillary system to provide “tooth and suction” for the Xypex treatment. If surface is too smooth (e.g. where steel forms are used) or covered with excess form oil or other foreign matter, the concrete should be lightly sandblasted, waterblasted, or etched with muriatic(HCL) acid. Rout out cracks, faulty construction joints and other structural defects to a depth of 1.5 in. (37 mm) and a width of 1 in. (25 mm). Apply a brush coat of Xypex Concentrate as described in steps 5 & 6 and allow to dry for 10 minutes. Fill cavity by tightly compressing Dry-Pac into the groove with pneumatic packing tool or with hammer and wood block. Dry-Pac is prepared by mixing six parts Xypex Concentrate powder with one part water to a dry, lumpy consistency. ii. For expansion joints or chronic moving cracks, flexible materials such as expansion joint sealants should be used. Xypex requires a saturated substrate and a damp surface. Concrete surfaces must be thoroughly saturated with clean water prior to the application so as to aid the proper curing of the treatment and to ensure the growth of the crystalline formation deep within the pores of the concrete. Remove excess surface water before the application. If concrete surface dries out before application, it must be re-wetted. Do not mix more Xypex material than can be applied in 20 minutes. Do not add water once mix starts to harden. Protect hands with rubber gloves. Apply Xypex with a semi-stiff nylonbristle brush, push broom (for large horizontal surfaces)or specialized spray equipment. The coating must be uniformly applied and should be just under 1/16 in. (1.25mm). When a second coat (Xypex Concentrate or Xypex Modified) is required, it should be applied after the first coat has reached an initial set but while it is still “green” (less than 48 hours). Light pre-watering between coats may be required due to drying. The Xypex treatment must not be applied under rainy conditions or when ambient temperature is below 40ºF (4ºC). For recommended equipment, contact Xypex Chemical Corporation or your nearest Xypex distributor. A misty fog spray of clean water must be used for curing the Xypex treatment. Curing should begin as soon as the Xypex has set to the point where it will not be damaged by a fine spray of water. Under normal conditions, it is sufficient to spray Xypex-treated surfaces three times per day for two to three days. In hot or arid climates, spraying may be required more frequently. During the curing period, the coating must be protected from rainfall, frost, wind, the puddling of water and temperatures below 36ºF (2ºC) for a period of not less than 48 hours after application. If plastic sheeting is used as protection, it must be raised off the Xypex to allow the coating to breathe. Xypex Gamma Cure may be used in lieu of water curing for certain applications (consult with Xypex Chemical Corporation or your nearest Xypex distributor). Nota: For concrete structures that hold liquids (e.g. reservoirs, swimming pools, tanks, etc. ), Xypex should be cured for three days and allowed to set for 12 days before filling the structure with liquid.